The dog sport of Flyball originated in North America in the 1970’s. The sport began when Herbert Wagner invented a tennis ball launcher for his ball crazy dog. That first launcher developed into the first flyball box which allowed the sport of flyball to be established. The first US competition took place in 1981 and the North American Flyball Association was formed in 1982. In Australia the first demonstrations of flyball actually took place in Perth, Western Australia in 1982. Flyball remained a demonstration sport until 1996 when the sport emerged competitively out of the Queanbeyan area in NSW then quickly spread to ACT, other parts of NSW,Victoria and Queensland. South Australia and Tasmania soon followed. The Australian Flyball Association was formed in 1996 and its role is to coordinate and regulate Flyball in Australia. WHAT IS INVOLVED IN FLYBALL? Flyball is a team sport where 4 dogs race against another team of similar speed. 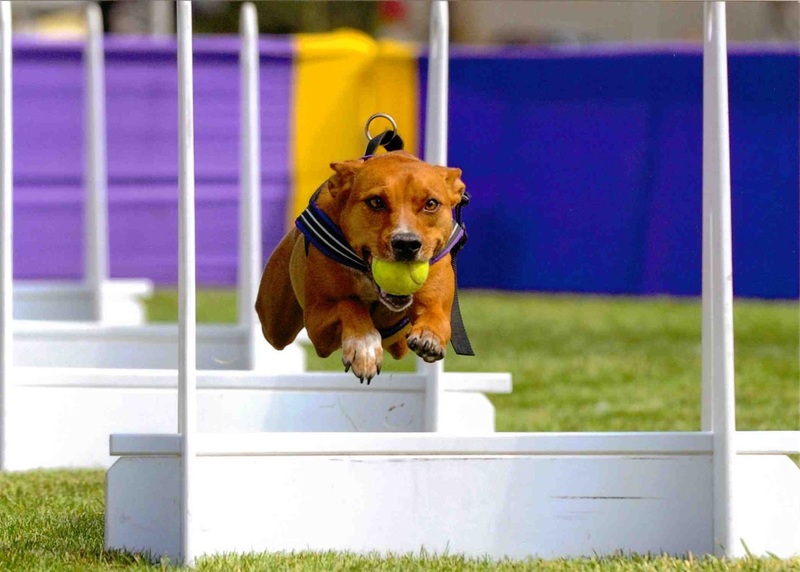 The course involves going through a timing gate, over four jumps, triggering the flyball box which releases a tennis ball, catching the ball whilst turning on the face of the box and then returning over the four jumps. If this seems like a lot of activity, well it's because it is just that! When the first dog crosses the timing gate start line, the second dog can commence its run and the race continuing until all 4 dogs have completed the course. The course is 51 feet up to the box and 51 feet back (we still talk in feet due to Flyball's North American origin). Note: for those who don’t remember feet and inches: 51 feet is approximately 15.5 meters. 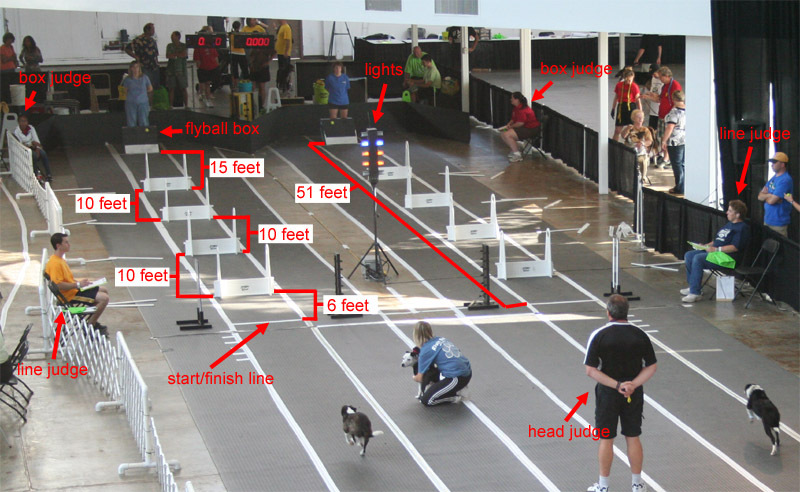 While Flyball tournaments can be run manually utilising stopwatches and line judges, electronic systems to facilitate accurate judging are now the norm. In the US, the current U-FLI record is 14.182 seconds and is held by the Touch N Go team! It was set on April 12, 2014 in Hurricane, Utah. The Australian record for a four dog team to complete the course is 17.1 seconds and is held by the Norwest Thunderdogs, who train out of the Castle Hill Showground in Sydney. Currently there are 45 registered flyball clubs throughout Australia –with clubs present in all States and Territories with the exception of the Northern Territory and Western Australia. 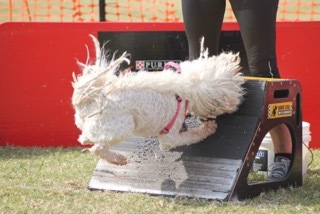 There are now approximately 1400 registered flyball dogs racing in Australia. WHICH BREEDS ARE BEST SUITED TO THIS SPORT? 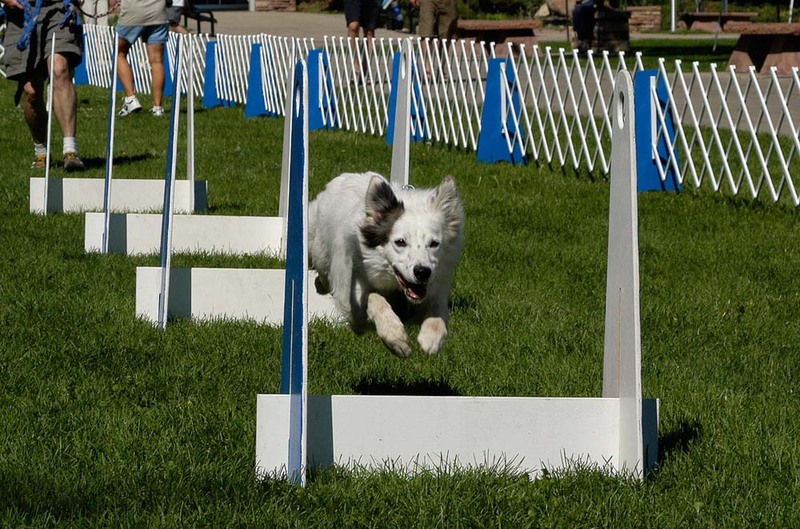 Flyball is not restricted to the working dog breeds – virtually all breeds of dogs can excel at flyball. There are Border Collies, Kelpies, Australian Shepherds, Whippets, Koolies, Cattle Dogs, Weimaraners, Labradors, Jack Russells, Foxies, Poodles (Toys, Minis and Standards), Papillons, German Shepherds, Pulis, Cavalier King Charles Spaniels, Staffies, various terrier breeds and even Irish Wolfhounds have been involved in flyball competitions. Flyball is certainly not restricted to pure breed dogs – cross breeds are welcome to compete and the flyball community includes many rescued crossbreed dogs. 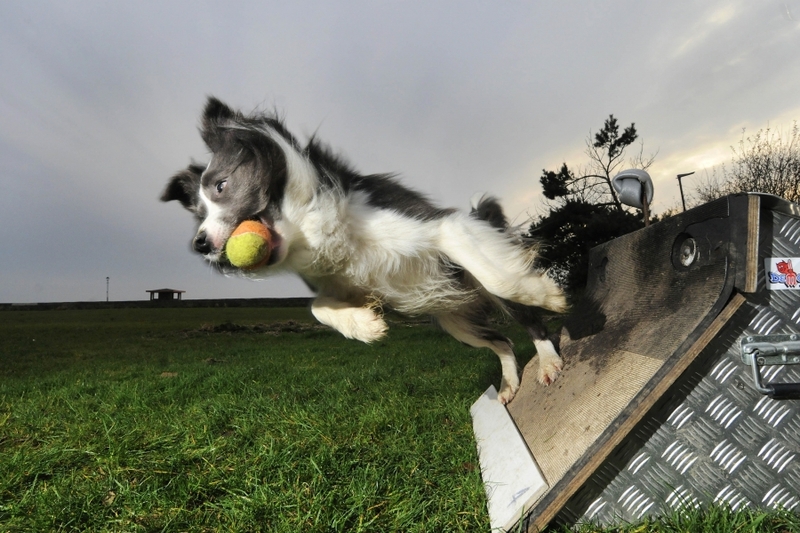 To train and compete in flyball, dogs, like all athletes, need to be fit and not overweight. You also need to recognise that young dogs need to complete their growth phase (dogs growth plates don’t normally close until 12 to 18 months of age – depending on the breed – large breeds take longer to attain maturity). For this reason, dogs are not allowed to take part in flyball competition until a minimum of 12 months of age and most clubs like to suggest that dogs not start to do any jump training or box work until they are at least 9 months of age. Box work training is very important as handlers want their dogs to be doing what is called a “swimmers turn" on the box. The swimmers turn reduces the stress on the dogs feet and shoulders when it jumps on the box. 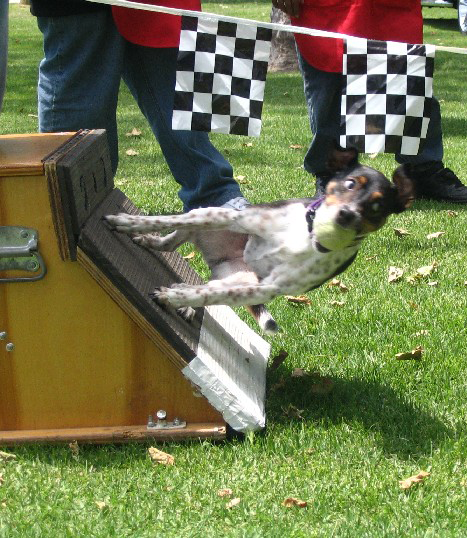 Dogs that slam the box with force are far more likely to develop injuries, hence the focus on box turns. It normally takes between 6 and 9 months to train a flyball dog to the stage of confidently racing in a team environment. The start point in flyball training is to determine if you have a left or right paw dog. Like most humans dogs will display a preference (though some dogs like humans are ambidextrous). It is important to find out early as this determines which way you train the dog to turn on the box. Flyball racing is conducted in divisions so that teams compete against other teams of similar speed – at the annual National Championships, there are normally 10 divisions ranging in speed from low 17 seconds through to 30 seconds. All teams are competitive within their own Division and close racing is assured. Dogs are required to jump between 7 inches and 14 inches – with the jump height determined by the height of the smallest dog in the team racing in the heat. So the small dogs are very popular in all flyball clubs – small fast dogs are particularly welcome. The 2016 Australian Flyball Championships will be co-hosted by Norwest Canine Association and the Sydney Psychos Flyball Team and are scheduled to take place at the Hawkesbury Showground in Sydney on 16th, 17th and 18th September 2016. Around 50 teams from all over Australia are expected to compete during that weekend. The public are welcome to attend and watch the racing. The Championships are on the same weekend as the Antique Farm Machinery Show, also held at the Showground area so there will be lots to look at as well as the dogs. The best way to learn Flyball is to join an established club and listen to the advice given by the clubs experienced instructors. Not only does the dog need to learn how to play flyball, the handler also needs to learn the basics, such as where to stand, where to release the dog for crossovers, and how to encourage the dog back to you as quickly as possible. Some dogs are best motivated by a favourite toy or in particular a tug toy whilst others - like most Labradors, are food motivated. You will need to find out what works for your dog. Flyball does tend to be addictive – many club members are currently training their fourth or fifth dog and sometimes may be racing up to 3 dogs at a single event. The dogs love the sport – just ask them at any competition and if they can hear you over the barking they will let you know! The best starting point for anyone interested in Flyball is to visit the Australian Flyball Association website and look at the information on getting started and how to find a local club. Lots of people also get started by watching flyball at a Show or demonstration and talking to experienced flyballers at the event.